In your computer life you will definitely need to learn how to install a PCI card into your computer. A PCI (Peripheral Component Interconnect) card fits into the slots provided on your motherboard and is like a mini hardware add on. For example, a PCI card might be a network card, a wireless network card, a video card, a firewire card, and more. Of course as time goes on, more add-on components are incorporated inside the newer type laptops and desktops. Learning how to install a pci card is easy and once you have done this, it is like riding a bike, it will just come naturally. Here are the steps to install a pci card into a desktop computer. 1. Unplug your computer from the wall and remove your computer’s case cover so that you have plenty of room to work. Also have your antistatic wristband on because PCI cards are VERY sensitive to static electricity. 2. 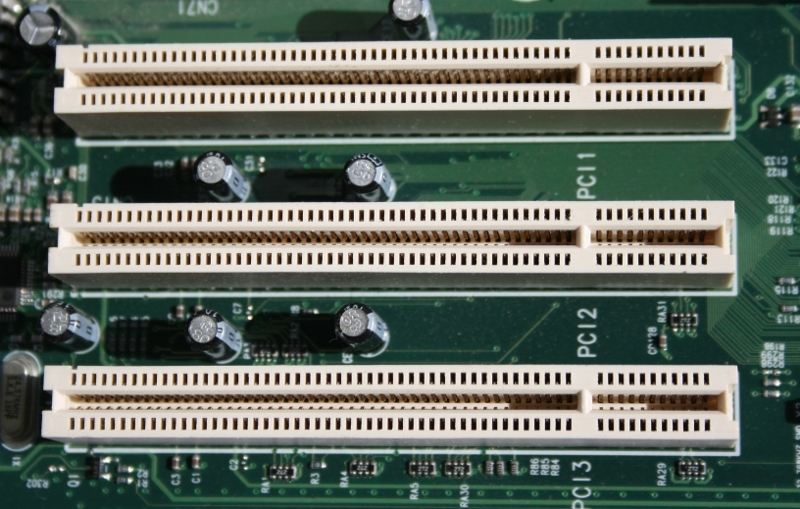 Locate your PCI card slots on your motherboard.Find a slot where your PCI card will fit. For example a PCI video card might take up more room as they are usually thicker so you might need to choose another slot. 3. 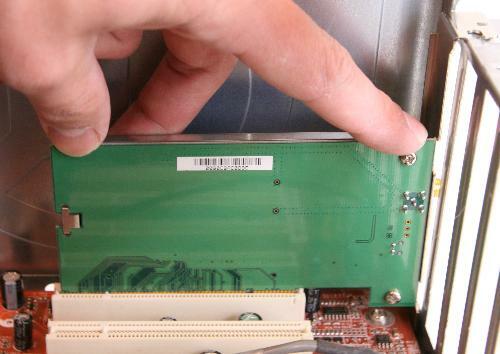 Then use a screwdriver to remove the screw (labeled B) holding the PCI slot cover. Once removed, set aside the screw, you’ll need that later! 4. Align your PCI card with the slots on the motherboard and make sure the hole in the face of the PCI card lines up over the hole which you removed the screw. 5. Now to install the PCI slot card, firmly press down on it until it is in position. Finally, replace the screw that you removed before to secure the PCI card into place. Plug your computer back in and turn it on. Your computer should detect the new card and be prepared to install any new drivers. Here are a couple tips if you have trouble when you install your PCI card. If your computer doesn’t turn on make sure the power cable is plugged into the wall and plugged into the computer’s power supply. After installing your PCI card, if your computer turns on but beeps a couple times and the operating system does not load, repeat the install process but try the PCI card in different slots on the motherboard, it is possible that you have a bad slot. Always read the user’s guide and familiarize yourself with the new card. If all else fails when you install a PCI card, contact its manufacturer for more help. In Category View (vs. Classic View) click Performance and Maintenance. Click “System” icon at bottom of window. Double-click on the device you want. For example if you installed a network PCI card then click on network adapters. I remember the ritual I once had when I bought a new graphics or sound card (back in the day when gfx cards were still pci….). I didn’t have an antistatic wrist-band and I was afraid of damaging my pc. Ah those were the days.. Thank you! Another tweet for my friends to read this very informative article!! how about installing a PCI-E device, do you have a guide? Fantastic Tutorial, Though It is quite Technical to Insert and Install a PCI Card for Regular usage but by following the above instructions you can perform it with ease! Appreciate the screenshots with the tutorials. Hey Mitz, No doubt this article is very helpful, but still I am unable to plug pci card on motherboard. The Metal slot cover of my PCI card is bigger than slot cover which i removed from my computer casing….. is there any difference of size in different casings? I am using HP Desktop PC. It’s a very helpful card used for expasion of system. Thanks for share with us how to install this. This is a good tutorial to install my PCI card. I read it completely, now I m going to install it to my PC. Thanks a lot. My hubby is the one who handles the hardware but I have to learn how to do this kind of things myself just in case. I am trying to learn how to fix, clean and what else there is to do on my hardware one step at a time. I find your blog very helpful. I have not used much PCI but once I tried to connect PCI of 33 MHz but fails. Now i thought, your idea could help me to successfully connect PCI to my PC.. Thanks any for suggesting this cool Ideas.